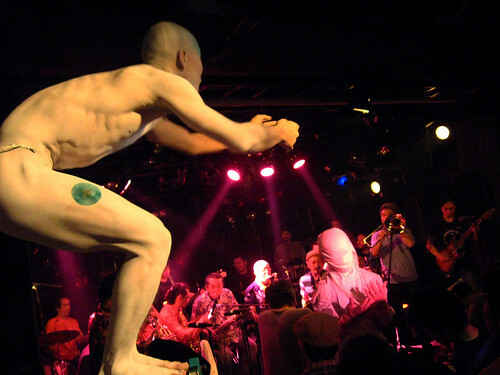 One of the only reasons to go to Roppongi is to go to Super Deluxe, one of Tokyo's only venues where you can pretty much guarantee to see something original and interesting on any night. 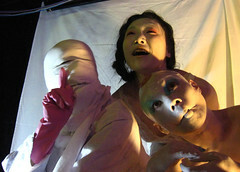 SOUNDROOM is a monthly event held there with "experimental music from Tokyo that defies categorization." Monday night's show certainly did have acts that defied categorisation! Colin and I arrived to find a huge area in the centre dedicated to numerous toy and homemade instruments, casio keyboards, synths, radios, lamps and all sorts of toys and unidentifiable stuff. We couldn't wait to hear and see how they were going to be used. First up were naph + Tetsuro Yasunaga + aen. Playing bass in a very nontraditional way was naph who also plays with mondii in RdL, makes music for games and commercials, and has worked with many artists from Tujiko Noriko to Kool Keith. 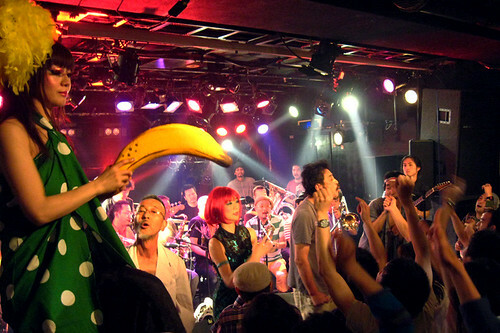 Tetsuro Yasunaga is from the experimental band helll. He left his bag hanging on his shoulder and played pulsating sounds and sinewaves on what looked like a synth. Looking like a bicycle courier while twiddling knobs and working from CDs was aen aka Yasufumi Suzuki who runs the Commune Disc label. He is also the organiser of this event. Together they played strangely engaging improvised noise and ambient sounds. The all-star (well, experimental music stars) guest band All The Frogs Are Our Weekend started soon after. Chihei Hatakeyama played noise and ambient guitar sounds with his flying V through a laptop and various pedals. Eriko Takahashi (elly) from experimental synth unit neohachi sat up front and waved her hands over the synths in her unique style. naph joined them on bass, and on drums was Tomoyasu Takanishi aka Flower Triangle, keeping things together. Their songs had some structure but allowed lots of improvisation and trance-inducing spacey drones. Next, those responsible for the odd objects appeared; OPQ (Takafumi Suzaki) with aritan-bo (Mayumi Arita) and Shibata. First they just played a radio half-tuned to a French language program and picked up random toys here and there, making sounds in a very twee way. But soon it all came together as aritan-bo played guitar under Takafumi who made amazing sounds and melodies on plastic wind instruments and keyboards with Shibata processing tape loops. Together they made some delicate folktronic noise with plastic toy piano tingles, ringing bells, balloon squawking and tossing, distorted voices and plenty of sounds from instruments and things I couldn't name. Loads of fun! Last was Flower Triangle. Looking like a skinny elf puppet, Tomoyasu jumped from laptop to drums to melodica, playing cool glitchy electronica that everybody seemed to be too tired to concentrate on properly. I'd definitely recommend Soundroom if you're looking for something different. It's on the last Monday of every month and is only 1000yen. Also highly recommended and at Super Deluxe is another monthly experimental music event called Test Tone, held on every second or third Tuesday. The next SOUNDROOM is June 29th. Details. The next Test Tone is June 9th. Details.